I am still developing and learning new skills as an artist and drawer/ illustrator. Now where I have almost finished my big wet mural painting somewhere in Copenhagen, I have had time and energy to develop techniques which are new for me, and I am creating a series of old ancient history miniatures, illustrating effects from the Danish ancient history in the media: Pencil or Pencil and ink on cardboard, which is my favourite media. Cardboard pieces on the shown artworks are measuring 10 x 10 cm cm or 10 x 15 cm, and I have created them all by use of magnifying glasses over some weeks. “For me, “ I say, because this time I have been inspired and learned from the way other Danish old ancient history illustrators usually draw. 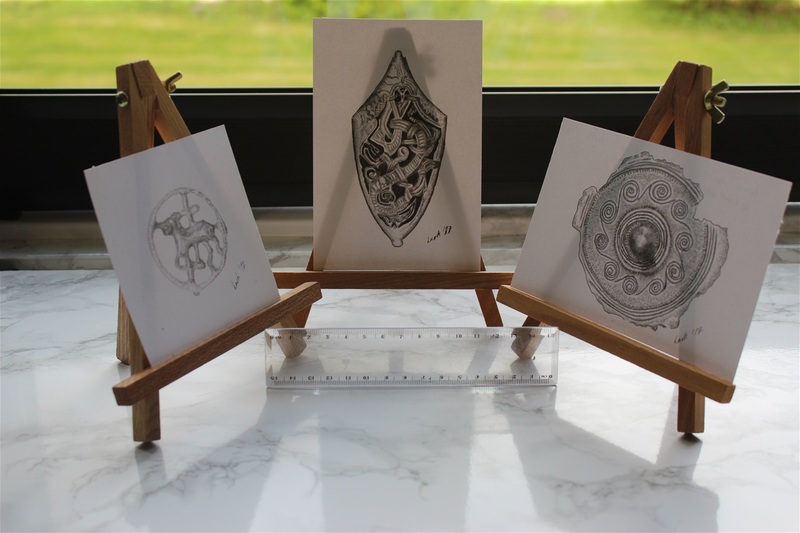 I draw Danish finds from the ancient metallic ages in this new art series of mine. Next weekend, I will not be at a very big art fair in Lokomotivværkstedet in Copenhagen. I am the quiet introvert type of person who feels happy about having only a limited group of people around me. Therefore, next weekend, I will stay away from the crowd at this art fair. If you want to experience me, you will have to wait till I am ready for a show or you will have to make an art order.